Inspirational quotes and butterflies filled the sidewalks of downtown Columbia as students from around the city chipped in to promote kindness. The event kicked off “Acts of Kindness Week” created by the organization Children’s Grove to bring awareness of the importance of being kind. Through May 5, Children’s Grove will promote a variety of projects ranging from a community kindness paper chain to planting trees throughout Columbia, all in the spirit of being kind. 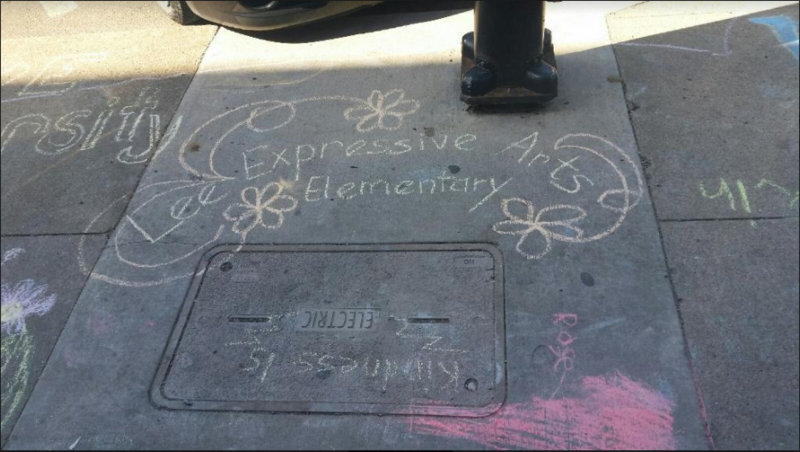 Lee Elementary School brought students to color the sidewalks near the intersection of Broadway and East 9 St. Joining in on the project, was Smithton Middle Schooler Sunny Ślusarz who traveled downtown after school had dismissed. She, like many who are involved with Children’s Grove believe Kindness is important in today’s world. Children’s Grove works with youth around Columbia teaching and building mental health according to their website. They are strong believers that even the smallest acts of kindness can change someone’s life, with their tag line being ‘A Single Act of Kindness Can Change A Life Forever,. Jordan Rogers is a first year writer for RBHS journalism. On his off time he enjoys watching St. Louis Cardinals baseball, and cheering on the Chiefs.